On a holiday in Sicily, my wife Andrea and I visited a small restaurant for lunch it was a very simple restaurant with no frills and relaxed and friendly service. 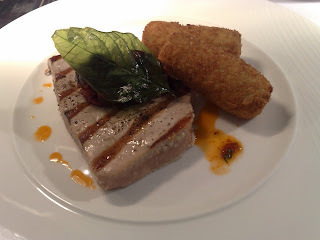 We looked at the menu and I noticed fresh tuna served with caponata and a side dish of cazzilli potatoes (Sicilian croquette potatoes). I ordered it and was amazed at how simple the dish was but how intense the flavours where. I was so impressed with the caponata that I asked the chef for the recipe, he gave me the recipe and from then on I fell in love with this dish. The caponata recipe below makes a lot more than you will need for this recipe, but it keeps for a month if stored in a sterilised seal jar in the fridge and is such a great chutney to have on hand. Try it with your favourite cheese, on a sandwich or with mixed cured hams. Place the potatoes into a large bowl and add the remaining ingredients, season to taste. Roll into desired shapes. Lay out three flat trays. In the first tray place the plain flour, in the second the egg wash and in the third the breadcrumbs. Dip each croquette first in the flour then the egg and followed by the breadcrumbs, making sure they are completely covered. Set aside in the fridge until ready to use. Salt the aubergines for 1 hour then rinse well and pat dry. Heat a generous amount of oil in a large pan and fry the aubergine in batches over high heat until golden brown, remove to a pepper towel and drain. In a large pan heat some olive oil and add the onions, garlic and celery, cook until browned then stir in the tomato paste and continue to cook for 5mins. Pour the vinegar and the sugar into the pan and cook until the sugar dissolves. Add the aubergine, olives and capers to the pan and simmer for 30mins, remove from the stove and add the herbs, allow to cool. Store in the fridge until ready for use. Heat a deep fat fryer filled with oil to 180c. Deep fry the cazzilli potatoes in the hot oil until golden brown and heated through. Place a grill pan over high heat. Take each tuna steak and season well with salt and pepper. Brush each steak with olive oil on both sides. Cook the steaks in the hot pan for 1-2mins per side; this will leave the tuna nice and rare in the centre. Place some of the caponata into a small pan over medium heat and heat until the caponata has been heated through. Place the tuna into the centre of a serving plate, place 2 croquettes to the side. Add a spoonful of caponata on top of the tuna and garnish with a deep fried basil leaf if using. drizzle a little of the oil of the caponata around the tuna. Serve with a simple dressed green salad and some crusty bread for a complete meal.